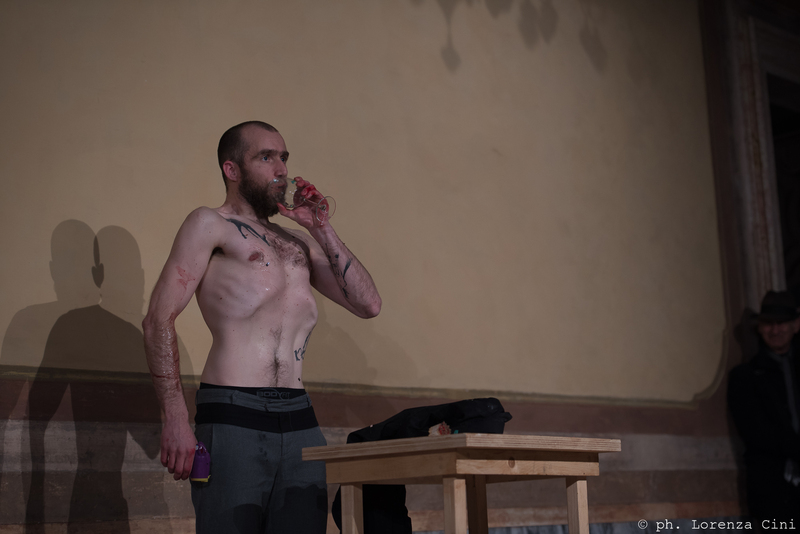 Reflecting and interpreting Marcel Sparmanns Performance „Das Brot der Luft… eine leicht-sinnige Annäherung“ (2016), forced me to rethink again and again how to begin and write this text. It is particularly difficult, as the performance itself deals with the opening and breaking of the commonly established norms and structures of performance. Therefore, common patterns and structures of analyzing and writing about this performance can, I think, hardly be applied, compared to other texts I have written for VIPAF 2016. This occasion is – unexpectedly – providing me the possibility to work with text as a structure, which also consists of established norms and patterns, which are expected to be there to understand and follow the content of a text, but with which I am trying to experiment here. The hard part will be to still convey the message, the essence, the idea of the performance „Das Brot der Luft… eine leicht-sinnige Annäherung“ (2016), through this new, non-structure. As well as the performance was an experiment to open up its inherent structure, during and through the performance itself; this text is an experiment to work within a structure, which unstructures established patterns. Imagine a book, a physical book, containing an essay or novel. There is a preface, at the very beginning of this book. This preface or forword is giving an introduction to what the further content will be about, it gives a first glimpse. Now imagine a performance space in one part of a huge hallway inside of a VenezianPalacio with high ceiling and crystal chandeliers. The „stage“ is still in the process of being finalized. One person is connecting strings from a cloth hanger to a wooden door, another person is precisely positioning a shirt on the floor, another (or the same?) person is positioning and re-positioning a table with wine glasses on top. The people are talking with each other, and one is giving the instructions.While the preface of the book is giving the introduction to what will happen in the novel, in the same way, the three people are setting up the stage to make thefollowing performance possible to happen. During the set up, Marcel Sparmann mentions to the already seated and waiting audience: „This is not part of the performance yet, we are still preparing. We thought we will have 20 more minutes to prepare.“ How does this statement let us observe what will happen next? Is this statement maybe already part of the performance, or is it an honest statement of the performer? In how far does this statement question the role of preparation, and the necessity of a structure or frame for the performance? Looking at the preface text of the above mentioned novel, as well as the described action of preparing the space for the performance, it seems both imply the same role.Both are facilitating what comes next. At the same time it is neither essential to read the preface to understand the story (in case of the novel), nor necessary to witness the setting up to understand the performance. 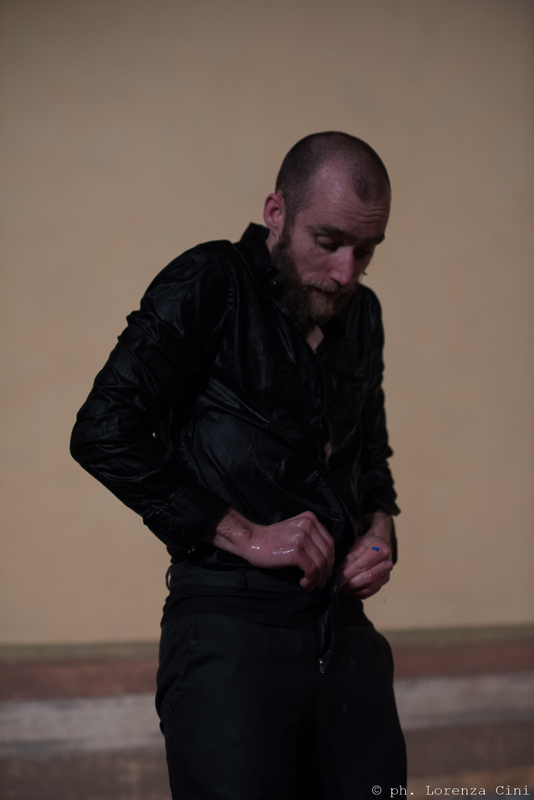 By exposing the audience to this ongoing process of setting up, Sparmann opens up the structure of performance itself. It shows parts, which are normally not visible but are actually the base for everything that follows. Making this part visible, means to break the structure from within. Marcel Sparmann explained his intention of this piece by comparing it with the action of throwing of a book on a table and observing on which page it would open up. His performance is not starting on the first page, but the audience enters during the preface, somewhere in the middle of the introduction. 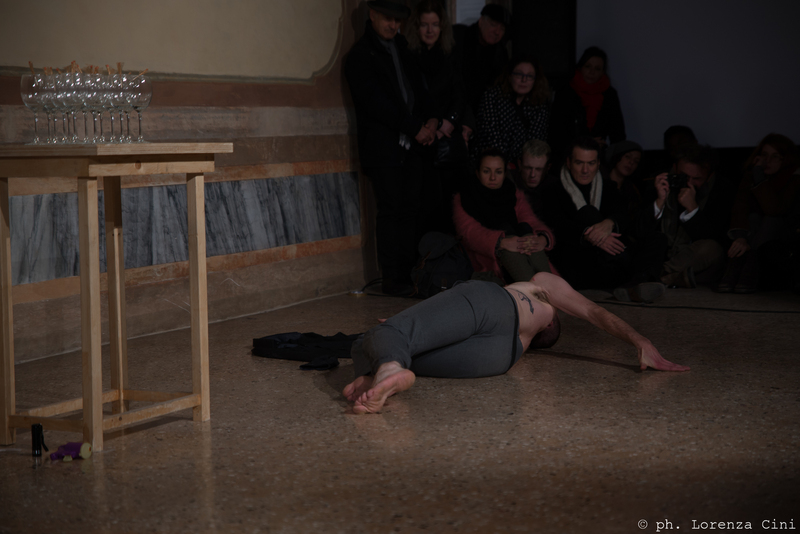 When the preface has finished, in other terms: when the setting up is finalized, the „actual“ performance starts with the artist placing himself on a specific spot on stage, coming to stillness. The set up of the space consists of four main areas. First and most prominent is the table with several wine glasses prepared on it. The glasses themselves are individually prepared with matches and some transparent cover. The next consists of thin white threads, which are attached individually on a wooden door and are leading to two wooden cloth-hangers lying on the floor. The third is a small electric stove plate with a pot of water, placed on the far right side of the „stage“. 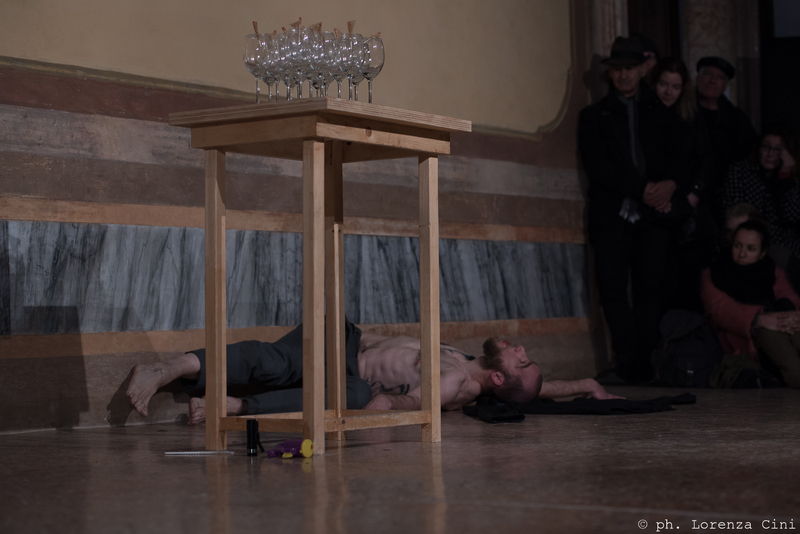 Marcel Sparmann begins with a choreographed movement, gradually and in slow motion he transforms from lying on the floor next to the back wall, to standing up straight in front of the table. This slow pace is continued while he is picking up the glasses, lifting them all at the same time by embracing them, first gently and slow, and then slowly increasing the pressure, making some of the glasses break and finally fall. In the moment when the first glass drops, something essential is changing, in the piece, in the performer, and also in the audience. After a few more glasses break and have fallen down, he drops all other glasses with an opening arm gesture. The choreographed movement is aprubtly stopped, underlined by addressing the audience (again?). Sparmann states that he does not know how to continue, and asks how „we“ should continue. 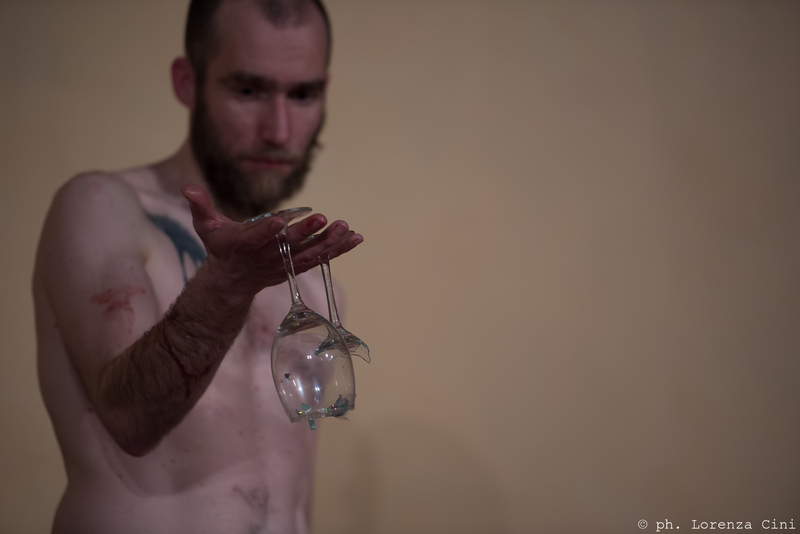 Proposing two possibilities from which the audience can choose: „…to continue in this „pathetic“ way or to change to something else.“ It seems that the performer resigns from being the person who decides, and the relation between performer and audience, as well as the unpredictable connection between the objects and the performer, appear to become the actual topic of the performance. In „Das Brot der Luft… eine leicht-sinnige Annäherung“ (2016), there seems to be a correlation between the degree of involvement of the audience and the visibility of the structure of this performance. While the audience is getting pulled out of their comfort zone of simply witnessing something, they are getting pushed into a situation where they are asked to be in control of how to continue, and if to continue or change.This situation lays open the structure of control, on which a performance is normally built on, breaks it, and makes this breaking the actual content of the performance. What is happening is, that he opens the frame, the structure of the performance, after establishing a rhythym, which will seemingly continue. 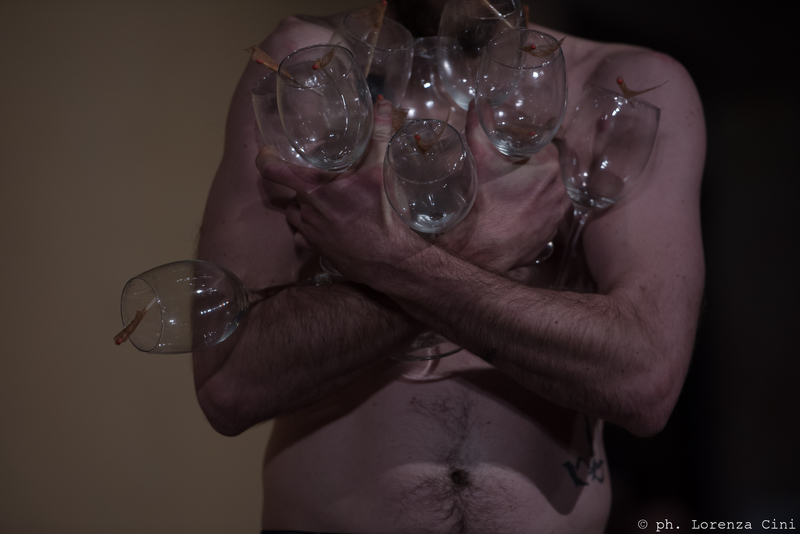 By interrupting this established rhythym – through dropping the glasses and addressing the audience – he is „unframing“ the actual performance and opens up a view on the structure ofperformance itself. The paradox is, to break up something, means it has to be constructed beforehand.And in the case of this performance: to lay open and break with the structure, you have to see its construction beforehand. Witnessing the setting up makes the existence of the construction or structure visible. The finalization of this construction though, is the starting point for its own deconstruction. The answer to „How should we continue this performance?“ is asked several times during the performance. No one from the audience answered, nor took control over the next steps. Maybe this is why he was asking again, leaving the space in a confused manner, coming back, asking again while executing several actions with the objects and materials, never leading or resolving into something, leaving again, and then adressing the audience again. His continuously repeated questions, and his undefined decision-making, gave space to think about, what has to happen to arrive at the point to even ask such a question. Even, thinking a step further (or digging a level lower? ), does the question „How to continue?“, not actually open up the question „How did we end up here in the first place?“. So might „Das Brot der Luft… eine leicht-sinnige Annäherung“ (2016) also raise an awareness for the necessity of critical reflection with/towards/about the world we are in? Does it facililtate to ask ourselves, how we got to where we are now? Where are we then/now? And in which structure are we in at the moment? Rather than asking how to continue, should we not first ask ourselves what made us become who we are and where we are?